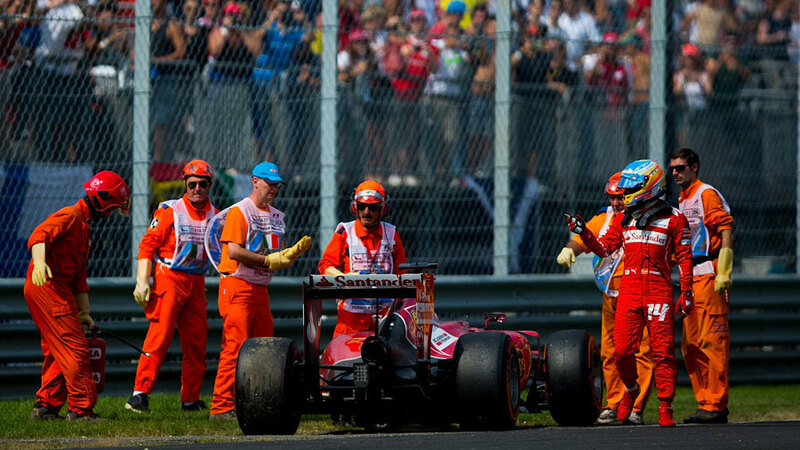 Fernando Alonso says Ferrari failed to repay the Tifosi for its support during tough times after he retired from the Italian Grand Prix with a battery failure. Alonso pulled up at the Rettifilo on lap 29 with smoke coming from the rear of his car, his first mechanical retirement at Ferrari since the 2010 Malaysian Grand Prix. Alonso says he struggled with the ERS issue for a few laps before he was forced to retire. "I had the battery not working for some laps before and then I lost a little bit of distance to the group of cars in front," Alonso said. "Then in that lap the car switched off completely to save the normal engine." With team-mate Kimi Raikkonen only picking up two points at Ferrari's home race Alonso feels Ferrari let its fans down despite their stellar support during a forgettable 2014 campaign. "Obviously we are not happy with the results in front of our people. This is one thing for the teams and one for the fans - we were not giving them any special result unfortunately; yesterday we were not fast enough and today we were struggling around position eight, seven, nine or whatever. This was not our goal but it's the way it is at the moment. We cannot do much more than this and I feel sad for them but very thankful for the support we had. "We've been in a very difficult season but nevertheless from Thursday here everyone was giving us maximum support and cheering us on, we felt this love for our team in the good moments and in the bad moments and unfortunately we did not give them this support."